The Licensing Executives Society was founded in Florida in 1965 as a professional forum for the exchange of ideas and views on the licensing profession. The Society rapidly grew in North America and soon spread to Europe, Asia, and Australia, where new national organizations were established. In the early 1970s, the need to coordinate the global interests of the societies, their members, and their clients inspired the creation of LES International. Today, there are more than 10,000 members in LESI's 27 member societies. PART ONE: THE CHANGING LANDSCAPE OF LICENSING. CHAPTER 1 EXPANDING BUSINESS OF LICENSING (Willy Manfroy). CHAPTER 2 TECHNOLOGY VALUATION (Dr. Richard Razgaitis). CHAPTER 3 THE EXPANDING ROLE OF TECHNOLOGYMANAGEMENT CONSULTANTS (Robert Goldscheider). CHAPTER 4 DREADFUL DRAFTING: THE DO S AND DON TSOF LICENSING AGREEMENTS (John T. Ramsay, Q.C.). PART TWO: NEW OUTLOOKS ON PATENTS,TRADEMARKS, COPYRIGHTS, AND TRADE SECRETS. CHAPTER 5 RECENT CHANGES IN PATENTINGPROCEDURES AND PROTECTION: DEVELOPMENTSIN THE EUROPEAN AND U.S. PATENT SYSTEMS (Dr. Heinz Goddar, Alan H. Gordon). CHAPTER 6 THE CRITICAL ROLE OF TRADESECRET LAW IN PROTECTING INTELLECTUALPROPERTY ASSETS (Melvin F. Jager). CHAPTER 7 COPYRIGHT, SOFTWARE, AND WEB SITEISSUES IN THE INTERNET WORLD (Michael A. Lechter). CHAPTER 8 TRADEMARKS, TRADE NAMES,AND TRADE DRESS (Thomas M. Small, Kenneth D. McKay). PART THREE: ADVANCES IN INDUSTRY-SPECIFIC LICENSING. CHAPTER 9 LICENSING IN THEBIOTECHNOLOGY INDUSTRY (Dr. Cathryn Campbell). CHAPTER 10 PHARMACEUTICAL LICENSING DURINGTHE REVOLUTION (Dr. Thomas A. Picone). CHAPTER 11 UNIVERSITY LICENSING TRENDS ANDINTELLECTUAL CAPITAL (Dr. Louis P. Berneman, Dr. Kathleen A. Denis). PART FOUR: FINANCIAL ISSUES, LEGAL PROTECTION,AND LITIGATION DEVELOPMENTS. CHAPTER 12 WHAT TO DO WITH TECHNOLOGY RIGHTSTHAT ARE FINANCIAL ASSETS AND INSTRUMENTS (Dr. Nir Kossovsky, Bear Brandegee). CHAPTER 13 IC-BASED CORPORATE CARVE-OUTS:STRATEGY, STRUCTURE, AND FUNDING (James E. Malackowski, Suzanne Harrison). CHAPTER 14 LICENSING AND LITIGATION (Ronald L. Grudziecki, Arnaud Michel). CHAPTER 15 ALTERNATIVE DISPUTE RESOLUTION:FIGHTING SMARTER, SPENDING LESS (Tom Arnold). PART FIVE: LICENSING IN THE GLOBAL COMMUNITY. CHAPTER 16 IGNORE EUROPE AT YOUR PERIL! (Prof. Dr. Peter Chrocziel, Nigel Jones, Thierry Sueur). CHAPTER 17 CHALLENGES OF LICENSING TO ANDFROM CHINA AND HONG KONG (Larry W. Evans, With a Contribution from Chi Shaojie). CHAPTER 18 IS THERE A FUTURE FOR JAPAN? (Dennis Unkovic). CHAPTER 19 LICENSING IN RUSSIA: OPPORTUNITIESAND PITFALLS (Dr. Natalia Karpova). CHAPTER 20 AUSTRALIA: LICENSING OPPORTUNITIESIN THE MEDICAL AND BIOTECHNOLOGY INDUSTRY (Rodney DeBoos). CHAPTER 21 CHALLENGES TO ARAB INDUSTRIESIN ACQUIRING AND SELLING APPROPRIATETECHNOLOGIES (Talal Abu-Ghazaleh). CHAPTER 22 THE SOUTH AFRICAN EXPERIENCE INECONOMIC DEVELOPMENT (Alan Lewis, Don MacRobert). 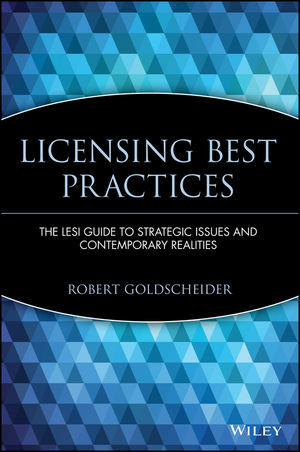 CHAPTER 23 PROSPECTS FOR INCREASEDLICENSING IN LATIN AMERICA (Fernando Noetinger, Gabriel F. Leonardos).